Uniquely designed to promote longer, thicker, darker lashes and brows, AQ Lash is a safe and natural serum formulated to restore the health and vitality of eyelashes and eyebrows by naturally encouraging hair matrix production. 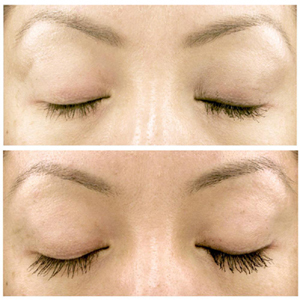 With regular daily use, AQ Lash helps to achieve fuller, longer, and more youthful-looking lashes and brows with less breakage and without the undesirable side effects commonly associated with other lash enhancing products. In order to prevent product contamination, AQ Lash contains 30 applicators, which are disposable and designed to avoid “multi-dipping,” which is known to introduce unwanted microbes when re-inserted back into the product solution. AQ Lash disposable applicators are fashioned specifically to allow maximum exposure of the active ingredients to the lash and brow base. EGF (OligoPeptide-1+Synthesized pepride), Water (Aqua), Glycerin, Panthenol, Biotinoyl Tripeptide-1, Lonicera Caprifolium (Honeysuckle) Flower Extract, Lonicera Japonica (Honeysuckle) Flower Extract, 1,2-Hexanediol, Caprylyl Glycol.